There's that silly, giddy moment in "Men in Black" where government agent Tommy Lee Jones deadpans to his rookie partner Will Smith, "You need to learn to relax… take some joy in your work." They happen to be driving upside down on the roof of a tunnel at about 1,000 miles an hour while Smith freaks out. It's funny because director Barry Sonnenfeld, his actors, his editors and his f/x people knew something about comic timing. 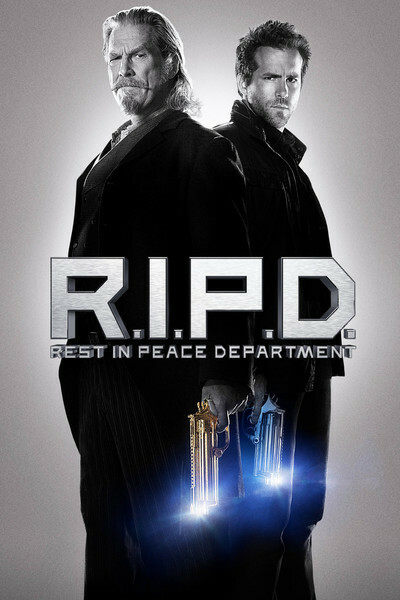 Robert Schwentke's "R.I.P.D. ", which wants to be the new "Men in Black"—a sleek pop special effects comedy—has awful, awful timing. The only accurate timepieces in this adaptation of Peter M. Lenkov's comic are Jeff Bridges and Mary Louise Parker, who play dead cops working in the afterlife version of a police station. They have chops worthy of a Howard Hawks screwball comedy, but they're trying to give color and snap to dialogue Hawks wouldn't have been caught dead directing. Bridges and Parker are fun to watch. She is a spin on the prim, sassy office brunette from the Progressive Insurance commercials. He is basically undead Rooster Cogburn from "True Grit" again, cocking his cowboy hat to the side and working wonders with his eyebrows, facial hair, 19th-century mullet and ill-fitting dentures. There are several extreme close-ups of him in the midst of some ridiculous action number, his ratty grey hair flying, his eyes huge and ablaze with mirth, the way they were when he floated under the skirts of bowling valkyrie in "The Big Lebowski". Images of Jeff Bridges enjoying himself are almost enough to make a movie work. "R.I.P.D." does its best to stop him dead in his tracks. The modern special effects comedy is one of the toughest hybrid genres to pull off. Alongside "Men in Black", there are a handful of fun ones, such as "Gremlins", "Beetlejuice", "Ghostbusters" and "Bill and Ted's Excellent Adventure". The pleasantly mediocre ones include "The Mask", "Jumanji", "The Addams Family" (again by Sonnenfeld) and "Pirates of the Carribean". At the bottom of the barrel are things like "Baby Geniuses" "Little Man" and "Nothing But Trouble", a Dan Akroyd/Chevy Chase horror-comedy better remembered for its Digital Underground soundtrack hit than its latex mutants and rotting flesh. The closest thing to a masterpiece of the form is "Kung Fu Hustle", in which Stephen Chow applied Tex Avery cartoon physics to gangster set pieces the same way Buster Keaton deployed steam locomotives in "The General", with a connection to story, character, setup and punchline that leavens and propels rather than pummels and overwhelms. "R.I.P.D." is mostly loud and graceless, despite some arresting hyperbolic visuals that deserve an action film of actual soul and purpose. It's simply too generic at heart to justify director Schwentke's delirious, sidewinding, arcing, snap-zooming and whip-panning anti-gravity camerawork. Time-slice photography lets a virtual camera poke around in otherwise still images of explosions and gun battles; cool, in a Discovery Channel sort of way, but whatever. A scene where Ryan Reynolds—this film's version of Will Smith's "Men in Black" character—gets sucked up into the purgatorial police station after being killed in a raid features some of the most seamless cloud effects I've seen since the heyday of Industrial Light & Magic's cloud tank work on "Raiders of the Lost Ark" and "Poltergeist". Later on, a supernatural vortex reminded me of the terrifying storm in Jeff Nichol's "Take Shelter". Let's not even go into the "Nothing But Trouble"-style CGI evil-undead characters who flounce and slobber through this flick. How many film titles can I mention in one review? I'm going for the record, anything to avoid thinking about this movie, which mostly punishes thought. It has fits of inspiration—reminders that we're dealing with talented people simply having a bad year, or forced to submit to creative oversight by executives who should only be trusted with the receipts. But it's an awful, awful film.